The beauty of Turkmen jewelry engages the imagination – as well as a curiosity to know exactly how all this lavishness came about. While large size is the hallmark of Turkmen tribal jewelry, many nuances distinguish the different tribal origins of individual pieces. The Turkmen comprise more than 20 distinct tribal groups. Of these, the most celebrated are the Teke (Tekke), Ersari, Yomut, Choudur, and Saryk – so celebrated that they are memorialized on today’s Turkmenistan Flag, represented by 5 stars and 5 respective carpet designs. 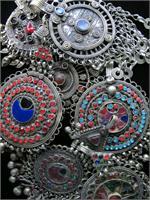 To many people, Tekke (Teke) is the archetypal form of Turkmen tribal jewelry. It is characterized by a thin layer of gold-wash (gilding) that highlights symbolic designs on an underlying silver base. Teke pieces are almost always studded with oval-shaped, vibrant-red carnelian or glass beads set in raised bezels. Tekke jewelry is highly artistic, with stylized birds, flames and spiritual creatures etched into the gold-highlighted silver surface. Borders of rams horns, bird heads, or trefoil motifs frequently run along one or more edges, with long clattering chain-dangles hanging below to make a wonderful sound with movement. Teke jewelry is usually constructed in 3 dimensions, with 2 silver layers (front and back) separated by a hollow space in between. Given the enormous size of Turkmen jewelry, this technique allows for the piece to be more light weight and easier to wear than if it were completely solid. Teke Turkmen jewelry is extraordinarily beautiful, and highly prized by collectors. It is one of my absolute favorites. In contrast to the ornate Tekke flourishes, the jewelry of the Ersari Turkmen is elegantly understated – at least by Turkmen standards. It is still grandiose, but with a more subdued surface treatment, which generally consists of a single or 2 intersecting lines spanning the entire piece. The remainder is left unadorned, except, of course for the obligatory Turkmen eye-shaped beads and dangles. In many ways, making Ersari Turkmen jewelry is an extremely challenging achievement. It has an unforgiving artistry, relying as much on the spaces between the design elements as on the elements themselves. Balance and precision are a must. Each line and bead is meaningful and precise. While some less refined Ersari pieces have endured, old Ersari Turkmen jewelry pieces with quality construction are getting harder and harder to find. Whenever my Turkmen friends in Central Asia find some for me, I post them on my Tribal Muse websites to show. If Ersari jewelry is understated, then Yomut Turkmen jewelry is over the top. This is the most ornate and lavish of all the Turkmen tribal jewelry traditions – and the most captivating. It is easy to stare at Yomut pieces, wondering how in the world these people made such extraordinary jewelry using the simplest of tools. I still do not know how it was possible for them to do it. But they did. Yomut jewelry, like other Turkmen jewelry is big, bold, and laden with symbolic cultural meaning. But it goes beyond that. Way beyond that. Yomut Turkmen jewelry pulls out all the stops. In its most flamboyant form, a piece of Yomut jewelry may be gilded entirely with gold, embossed, studded with multi-colored beads, and haphazardly adorned with numerous decorative plaques and medallions fused to the surface. Of course not all Yomut pieces are quite so elaborate. Some may have only one or two of those attributes, the most notable being the fused decorative plaques or stylized rams horns. Regardless, Yomut Turkmen tribal jewelry is extremely collectible, and breathtakingly beautiful. If Turkmen jewelry intrigues you as much as it intrigues me, then my next blog entry may be enticing. In Part III of this series, I explore cultural symbolism as seen through the lens of Turkmen tribal jewelry – one of my favorite topics! Please join me for the next installment – and anytime to share your comments and experiences. I would love to hear from you. You can see my tribal jewelry pieces at Tribal Muse and Tribal Muse on Etsy. Tribal Muse is now on Facebook too…please visit! Oh, and you will also find Tribal Muse on Pinterest. Enjoy. The Belt is both a functional accessory and a decorative statement piece. For centuries, the style of belt could imply a specific status, event, and affiliation. For example, the women of the nomadic Kuchi tribe of Central Asia wear decorative belts not only to secure their garments, but also as a repository for coin wealth. and announce their power to others. In some tribes, brides received richly embellished belts to wear on their wedding day. These belts were cherished for their lifetimes, and passed on to daughters through the generations. Men in many cultures wear elaborate belt buckles to announce their affiliation with certain people, communicate their wealth, and announce a position of power within the group. So sorry, the Coupon Code for June 2015 has expired – Please see more recent blog posts and your Tribal Muse subscriber emails for any active Coupons that are currently available. Many thanks, Andrea @ Tribal Muse. If you love Tribal Jewelry, then you are probably already familiar with Kuchi Jewelry…if not, then you are in for a treat. Of all the different tribal traditions, Kuchi Jewelry is among the most exuberant, joyful, and eclectic of them all. Their festive pieces are filled with color and sound, with mounds of dangling charms and bells clattering together with every movement. What better place to start an exploration of Tribal Jewelry Styles than with the vibrant jewelry of the Kuchi. The Kuchi (Kochi, Koochi) are a nomadic tribe who have lived along the old Silk Road Trade Routes in Central Asia for an estimated 3000 years. Not surprisingly, their name comes from the Persian word meaning “Wanderer.” Much of the terrain in this part of the world is rugged and not easily navigated, but the Kuchi became masters at trekking, even to the remotest areas. They were the primary merchants serving the people of Central Asia, bringing needed goods to the sparse settlements that were scattered at considerable distances from one another. People literally relied on the Kuchi for their very survival. They supplied vital commodities such as meat, certain textiles, and livestock which would otherwise have been unavailable. At one time, The Kuchi held a monopoly on the camel trade…if you wanted to buy a camel, you had to find a Kuchi to sell you one! Sadly, their numbers as dwindling as a result of international turmoil and alternative transport options for trade. Is it Kuchi or Kutch? At first impression, it is easy to confuse the Kuchi tribe with the people of Kutch (Kachchh) in western India. The word “Kutch” in India translates to “dry” or “arid,” since Kutch, India sits in a dry dessert. True, there are many such similarities between Kuchi and Kutch jewelry styles, but similarities are common throughout Central Asia and India. Nevertheless, there could well have been some idea-sharing between the two groups, since the Kuchi were prolific wanderers who migrated over immense distances. For purposes here, though, the Kuchi and the people of Kutch are treated as separate tribes. More on the wonderful tribes of India in later posts…much more! Over the centuries, Central Asia has had its fair share of different rulers – each with a specific mandate on how people should live their lives. The Kuchi, however, managed to retain their own distinct traditions, primarily because of their nomadic lifestyle and valued status as traders. The Kuchi social group was very friendly and interactive, with frequent celebrations that included singing and dancing. As the primary suppliers of meat, the Kuchi had large herds of livestock to maintain…a task generally falling to the men, requiring them to be gone from camp for long periods of time. While the men were away, the Kuchi women assumed the tribe’s business of bartering and negotiating with locals. Enjoying freedoms not seen elsewhere, Kuchi women regularly interacted with both men and women for trade. It was not unusual for them to wander publicly and unhindered into towns, often dressed in bright colors with only a modified veil instead of full cover. Kuchi Tribal Jewelry reflects this freedom in its style, and combines it with various the influences from the many different cultures visited while traveling. The head, the hands, the ankles…there was virtually no part of the body that was left uncovered with some form of Kuchi Jewelry. Since many of these pieces were intended to be worn daily under very rough conditions, they were often boldly crafted of sturdy metal so as to withstand a rigorous nomadic lifestyle. This may explain why so many old Kuchi pieces are still available today and in relatively good condition even after decades of rugged wear. Even though Headpieces did not generally cover the entire head, they were flamboyant to be sure. Headpieces were worn spanning the forehead, with dangles and small pendants hanging from the bottom edge to frame the face. Large jangling earrings in a variety of shapes adorned the ears. Nose Rings with or without chains were worn daily or to special events only, as were large studded hair clips and barrettes. Necklaces, Pendants, Amulets, Coins, Beaded Fringes…just about any colorful and jangly piece of jewelry could be worn around the neck. On any given day, a headpiece might also double as a necklace, and vice versa. A few word about the more eclectic necklace designs…Many Kuchi Tribal Necklaces are breathtakingly gorgeous even by today’s standards. Symmetry and consistency were not always a requirement, however. It was often the wearer’s personal sense of exuberance combined with available materials that ultimately determined the form. Many Kuchi Necklaces might have additional attachments or new alterations to meet the whims of each successive owner. While these necklaces might not fit contemporary design criteria, as spirited tribal jewelry they are flawless. Practical as well as beautiful, mountains of ornate bracelets adorned both the upper and lower arms. Many were long, extending high up from the wrist to protect against injury while working. Cuffs were often secured with a pin-hinge clasp to prevent them from falling off during the rugged activities of the nomadic Kuchi woman’s daily life. Rings, rings, and more rings were everywhere on all fingers or just some fingers – sometimes attached by chains to a bracelet cuff, or all by themselves…however the inclination went. Besides being practical, Jewelry Belts were celebration items, often associated with weddings. Today, Kuchi handmade beaded, embroidered, and jangling belts are a mainstay of dance troupes and tribal aficionados. Also common, were pendants and amulets that tied at the waist or buttoned to a bodice. Jangling anklets were a beloved Kuchi accessories. They came in a variety of styles and shapes – hollow anklets with jangles, chain-linked anklets with bells, and cuff style anklets, with or without clasps. Anklets were such a popular item, that even the camels wore them, clanging through the high desserts with every step. Who wears Kuchi Jewelry besides the Kuchi? Kuchi Tribal Jewelry is a favorite of belly dancers, theater people, and anyone wanting to make an undeniably tribal statement. Not only is it just plain fun to wear, but the very act of putting on Kuchi Jewelry somehow seems transporting to a different time and place. The weight of it, the sparkle of it, and the sound of it conjure up pleasing images of a confident Kuchi woman heading into a village town for all to see. Why do you love Kuchi Jewelry? Tell us in the comments section, we would love to hear from you! So sorry, the Coupon Code for April 2015 has expired – Please see more recent blog posts and your Tribal Muse subscriber emails for any active Coupons that we have available. Many thanks, Andrea @ Tribal Muse.